QUICK! It’s New Year’s Eve and you aren’t doing anything special or making anything you really want to eat. You can fix that RIGHT NOW. Here are our top ten most simple, tasty, Nueske’s family-and-employee-tested appetizer recipes that you can whip up with a handful of ingredients and scant or no cooking skills! For those of you with even moderately well-stocked kitchens, you may not even have to run to the store to make most of these (well, maybe for the figs…). 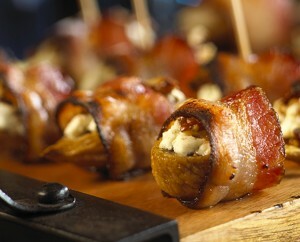 Figs stuffed with chevre and wrapped in smoky Nueske’s Bacon. Happy New Year to everyone. Be safe and have fun…cooking!